I just want to thank you for helping us find another lamb for my son. It was the Dakin lamb security blanket, but yellow with the blue face…It’s crazy, I did not think we would ever find one… It really seemed impossible… I searched all over online forever! I’m sooooo happy that I found this site. Now we don’t have to worry if “lamb” goes missing or falls apart… I have put the new one away, just in case. What a difference between the two of them. It really made my day, to get that in the mail! Truly wonderful thing you all do!! Thanks again sooo much!! 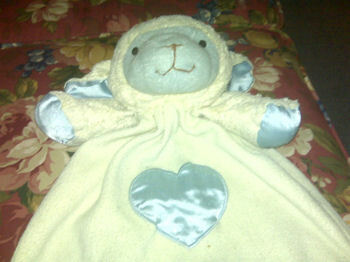 I am looking for a lamb blanket that my 1 year old son has become very attached to! I picked this up at a thrift store brand new in the box, before he was even born. I threw the box away not thinking, I guess… and I really didn’t know the name of it or anything. I know it just has a tag that says Dakin and the address, and it says visit Dakin on www.applause.com and a smaller tag behind that that says like two numbers and a letter. But after looking it up, I guess it’s a lovie blanket, but an older one. It looks just like the new one, but his face is blue and he doesn’t have the ribbon, but I think I pulled off the tag because of safety reasons right when I gave it to him. He has gotten to the point where he wants him all the time and loves to carry him around. I would love to find another one like this if they still have them around… but I’m also curious about how old it is. thought you might be interested. thought i recognized the face.